We returned to Comic-Con after missing the last few years since 2010. This time we brought a newbie with us to attend her first Con. Sabrina, Jesse’s girlfriend, had never attended Comic-Con so this was her first exposure to all there is to take in and do while in San Diego for the convention. Thanks to my best friend Jim, we were able to come down a day early and get settled into his condo in Santee. We dropped off our stuff and hopped on the trolley to head to the Convention Center. Our goal was to see what we could do outside the convention center on Thursday as we only purchased passes for Friday. After about an hour ride on the trolley, we hopped off and headed to the Merchandise area in the Marriott to pick up the shirts we pre-ordered for Jesse and Sabrina. 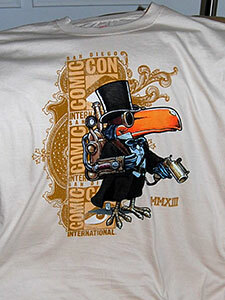 They decided to go with the Steampunk version of the 4 designs that were being sold. 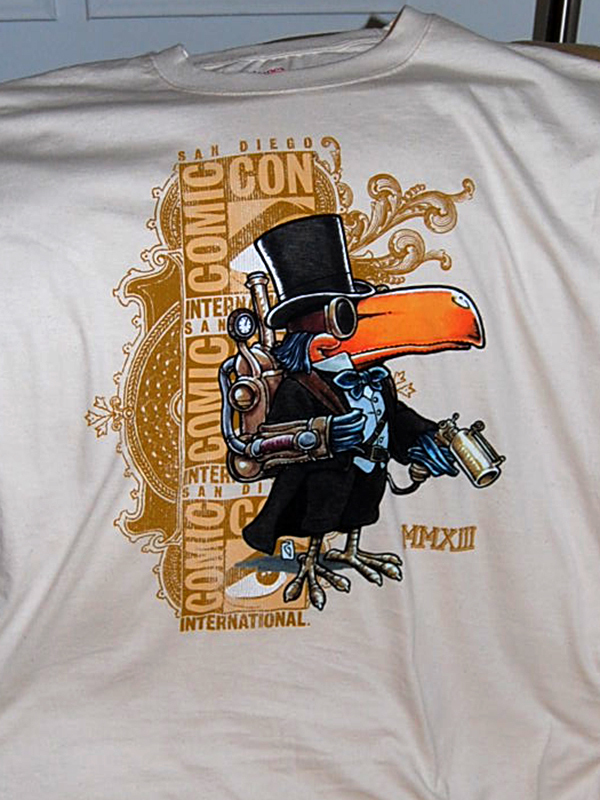 We stood in line, a common theme while at Comic-Con, for about a half hour before reaching the area and obtaining the shirts. Afterward, we headed to the Omni for the annual SDCC Blood Drive sponsored by the tv show, True Blood. We ended up spending 4 hours waiting for our turn to donate. In the end, Renee was denied the opportunity because her veins were so deep, but we both received the blood drive swag anyway. Jesse and Sabrina were glad when we finally exited, but we had to rush to make the trolley as we were late for dinner with Jim and his daughter’s family back in Santee. We enjoyed a great time with them at Oggi’s Pizza before calling it a night. 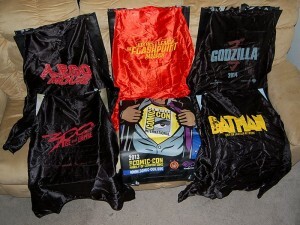 This year Comic-Con added capes to their bags with several being hot items to attain while others not so much. We were up early Friday morning and rushing to the trolley so we could get our passes and get on to the show floor as quickly as possible to try and get autograph tickets for the WWE signing at the Mattel booth later that day. Despite nearly sprinting through the pass lines (careful to get exactly the bags with capes we wanted) and circling the convention hall at a rapid walk, the tickets for the signing were already gone by the time I arrived at the booth. I was encouraged to come back early to get in the stand by line for a chance to get an autograph. We stood in an extremely long line for posters/poster tubes from the Fox booth only to be told they ran out before we had even journeyed 1/3 of the way. We wandered the booths on the expo floor stopping at several Steampunk booths which Jesse wanted to see. I eventually left everyone to get in the standby line for the WWE signing. I struck up a great wrestling fan conversation with a British kindergarten teacher who was teaching in Hong Kong. As the WWE wrestlers appeared, the crowds chanted their names and I held out hope we might be able to get an autograph. A few weeks prior, I had found a Daniel Bryan t-shirt in the bargain bin at Hot Topic for $5. The week prior to Comic-Con, he had been named the title contender for the WWE championship at Summerslam. I brought my shirt and was pleased when I was able to get it autographed and a photo with Daniel Bryan. 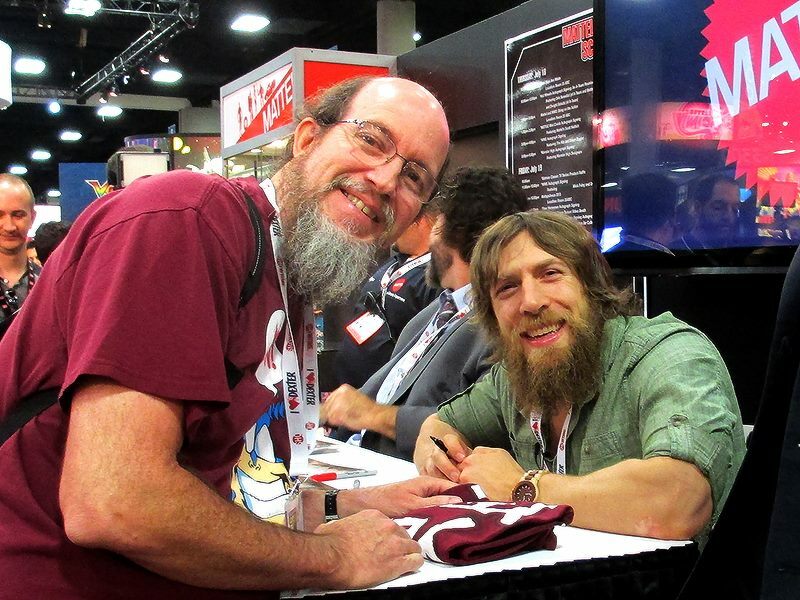 I was able to get a shirt signed and then take a photo with WWE title contender Daniel Bryan. I chatted briefly with WWE Hall of Famer Mick Foley though his autograph was hardly distinguishable after singing so many things that day. I left that booth pleased and reunited with the family at The Tick booth where I snagged one of the few remaining 25th Anniversary Tick shirts in my size along with a “SPOOON” bumper sticker. We wandered the Expo hall some more stopping at many booths before returning to wait for the Del Rey/Random House Star Wars novel signing by John Jackson Miller. I wanted to get a signed edition of his Lost Tribe of the Sith: Collection they were giving away. I was able to get one for myself and one for my brother Chris thanks to Renee standing in line with me. We went back by The Tick booth and I was able to get a signed collection of Tick comics by the creator Ben Edlund who was very nice and took time with each person in line. By now, Sabrina was excited about the chance to go to the XBox Lounge at the nearby Hyatt. We walked over to the Hyatt and she was able to try the new Halo game and enjoyed playing their new XBox One system. She also got a badge that encouraged her to visit many booths on the expo floor to collect Halo badges and Helmet pins. She managed to get all but one as the vendor ran out before we arrived. Renee and I managed to walk a little of the Gaslamp Quarter while Jesse and Sabrina hunted Halo pins on the show floor. We saw several areas that were outside the convention center that looked cool. One big disappointment was the limited availability of the Godzilla Encounter. I had hoped to see it, but they only gave away 300 tickets each day. All in all, we had a great time and hope to be back again next year. We ended our day after a trolley ride back to Santee with a trip to In-N-Out Burger. It was enjoyable and thoroughly exhausting. It’s funny how we forget the energy you burn when mingling with over 100,000 other excited people at Comic-Con. Though the lines were longer than ever and we didn’t go to panels as we had in the past, we enjoyed ourselves and talking with fellow Con attendees. If you have never been, it really is a great experience that I recommend everyone try. If you want to see more photos from Comic-Con, check out my profile on Facebook. We have cleaned out the closets and shelves to help our son raise money to go to Europe for his Senior Class trip. If you are in the area, please come by as we will have lots of collectibles to include: Disney, Star Wars, Lego Bionicles, Hot Wheels, Speed Racer, DVDs, books, video games, software and more. 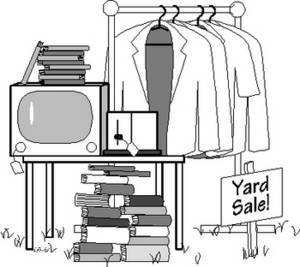 It will be at 22880 Wren St in Apple Valley, CA on Oct 15-17, 2010 from 8am to 2pm. If you are unable to come by and would still like to help, please consider sponsoring Jesse on his trip. Thanks to those of you that have already sent money. He is close to covering his first installment due on October 24th. So I waited a little longer between posts this time, it’s not like anyone is paying for these. If you would like to though, feel free to send cash. So let’s try and get up to speed on what’s happened. I enjoyed seeing the Lakers win another championship especially against hated Boston. I was glad to see the USA exit the Group round of the World Cup, but sad to see them advance no further. I celebrated my first Father’s Day after my father passed. Jesse dyed his hair two colors this year and looked like he should be cheering for Brazil with his half yellow, half green hairstyle. Renee and I went to see Toy Story 3 and Sherk Forever After. TS 3 was better, but they both had some laughs. Jesse went to camp in the mountains while I attended the Voices That Matter Web Design Conference in San Francisco. We spent the 4th of July at home and watched the fireworks from the backyard on a rather cool night. Last week, I attended the ESRI User Conference in San Diego and increased my GIS Web API knowledge while enjoying many meals in the Gaslamp Quarter. This brings us to the past weekend’s activities which revolved around attending our 3rd Comic-Con. We left for San Diego after Renee finished work on Thursday and arrived just before midnight. We settled in at my best friend Jim’s condo after waking his roommate. We were up early Friday morning and off to the trolley station for our journey to the Convention Center. The closer we got, the more crowded the trolley became until noone could get on due to standing room only. We joined the swarm of attendees pouring across the street and found our way to the registration area to pick up our badges, Warner Bros Studio bags and event guides. We headed for the Expo Floor before realizing that we should have stayed where we were for an autograph session. Jesse wanted to get a postcard and autograph from the writer of several Warhammer 40,000 books and the upcoming movie, Dan Abnett. The line was longer than the one for several stars form the Farscpae TV series in the next booth. Afterward, we headed back to the expo floor to begin our end to end journey. We made it 3/4 of the way before deciding to leave so I could attend the Star Wars: The Old Republic MMORPG game panel. We stood in line for an hour and barely made it inside. This room hosted Star Wars panels all day and rooms are not cleared after each one. We left once the question period began and headed to the blood drive booth. We were directed to its new location and then went the Del Rey Star Wars expo booth for a book signing by Sean Williams, author of The Force Unleashed novel and the newly released Old Republic: Fatal Alliance novel. We journeyed across the show floor again and went to the blood drive. It took 1 1/2 hrs to complete the process. We were rewarded with a large True Blood T-shirt (too small for either of us), vampire bite band-aids and a True Blood bottle of water. In previous years, we left with a big bundle of toys/collector items, so we were not very impressed. I convinced Renee and Jesse to take a walk into the Gaslamp to the spot were I saw Flynn’s Arcade while attended the conference the week prior. We were rewarded with a pass to enter. 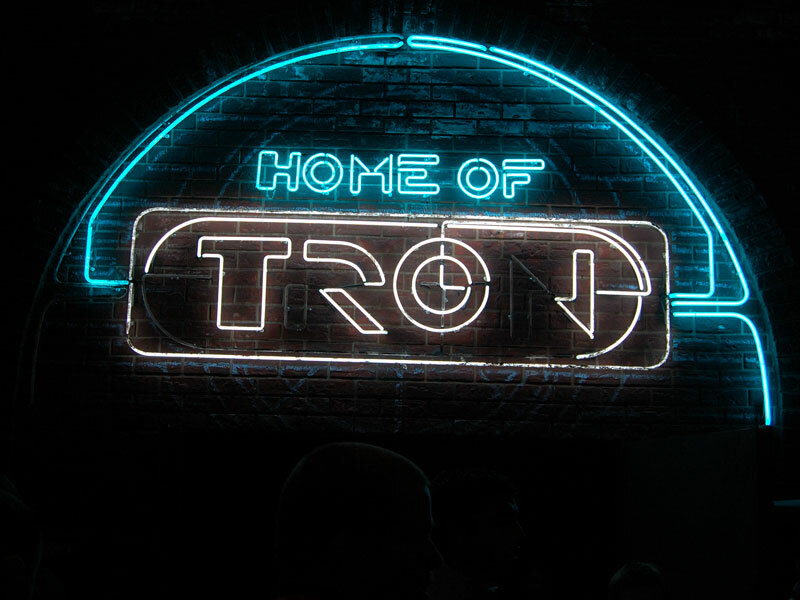 At the door we were given a Tron coin purse filled with Flynn’s Arcade tokens. The arcade was filled with 80’s games like Joust, Space Invaders and the Tron game Space Paranoids. One wall was filled with TVs showing gameplay from the new Tron game. At the back of the arcade under the Tron sign, a hallway led the Flynn’s workshop. Lights flashed and dialogue played from the movie and doors opened leading to a bright blue lighted hallway. Rounding the corner, we entered one of the coolest rooms called the End of The Line Club. 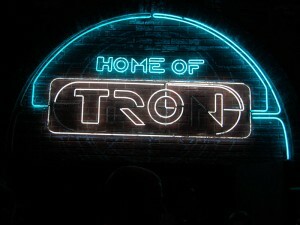 It was designed just like the Tron world with blue lights and sleek shapes. They had many props from the movie and upcoming products based on the movie displayed. They gave us free Coke Zeros in aluminum bottles too. Suddenly, the lights dimmed and we here audio from the movie playing while lights flash and change color. The walls begin to display scenes from the movie and we hear Flynn. During this, a model dressed in movie wardrobe walks around the area. This was one of the coolest things we saw all weekend. After wandering around Flynn’s a little more, we exit and visit the Palm Restaurant to see some of the new Marvel drawings on the wall. We stopped at Cafe Diem from the Eureka TV show on SyFy Network. After catching the trolley back, we visited with my Goddaughter Christina, her husband Marc and enjoyed seeing their soon to be 1 yr old son at Jim’s condo. After a short night, we packed up and headed for Qualcomm Stadium to catch the trolley. We arrived at the Convetnion Center and hurried through registration to get in line for Ballroom 20. We still ended up on the stairs coming up from the Marina. While in line, I left Renee and Jesse to photograph the 501st Legion Star Wars fans as they posed in costume on the back steps of the Convention Center. Despite the long line, we did manage to make it into the panel for Chuck. It was kicked off by a montage of clips from the previous season and “Jeffster.” Always a fun panel. We decided to stay and sit through Family Guy and The Cleaveland Show so we could see Futurama and The Simpsons panel. The scenes from the upcoming 3rd Family Guy Star Wars spoof were pretty funny. The Cleveland Show did a table read for an episode based on Comic-Con that brought a lot of laughs. The Futurama panel was funny as well with scenes from a Comic-Con episode and a table reading for an upcoming episode. The Simpsons panel was funny, but we left once questions from the audience began to head for another room. We were able to avoid a line by going into the Cartoon Voices panel which had many of the voice actors from older cartoons. We were there to see the panel following it: Warehouse 13 and Eureka. We enjoyed both of those panels and then sat through Nikita and Human Target to have a seat for the Mythbusters panel. The Mythbusters stars were a BIG hit and didn’t disappoint with clips of the upcoming season and behind the scenes stories. We sat through 10 hours of panels that day and were wiped out as we headed to the trolley and Qualcomm. We arrived home just before midnight Saturday night. After a short night, Renee was off to work early this morning. It was a fun time, but we think 3 days might be better than 2 at Comic Con. Last year, we did 4 days, but it was just too much. Great time and now we are thinking about next year as tickets sell out faster each year. It’s Monday December 28th and another Christmas has passed. I enjoyed having 4 days off from work and spending time with the family. While I stayed home on the day of Christmas Eve, Renee and Jesse did some last minute gift shopping. I did a little cleaning up around the house and made some pumpkin cake. It’s like pumpkin pie without the crust. After they returned and finished their wrapping of presents, we set up the tripod for family portraits. They were great fun and if you are on Facebook you can see them if not be patient and I may get them up on the website…eventually. Following that, we went out for some fast food and to look at lights around Apple Valley. As the evening drew to a close, we gathered in the living room for our tradition of reading the birth narratives of Jesus from the gospels of Matthew and Luke. Jesse led off with Matthew and I picked up with Luke. Jesse then chose one gift to open and we turned in for the night. Christmas morning came and I was the first one up. I read the paper and talked to mom in FL while waiting for Jesse and Renee to awaken. Once everyone was showered and awake, we enjoyed some homemade banana bread before Jesse passed out the stockings. After the stockings were done, Renee took over and began passing out presents. Halfway through opening presents, we were joined by my best friend Jim Ritch. He drove up from San Diego after duty on the USS Reagan the night before. Too sum up the presents this year: Jesse = guitar, music and books, Doug = golf stuff, candy and new Zelda DS game, Renee = Magic Bullet, kitchen stuff, and popcorn. We watched some NBA before enjoying a ham dinner. We then watched the Chargers demolish the Titans and secure the #2 seed for the playoffs. The next morning, Jim went for a 16 mile run before showering and heading back toward SD. After he left, we went out to spend some gift money at Target, Best Buy, Tom’s Music, the mall, and finally the Super Target. On Sunday, we sat around the house doing nothing and eating leftovers/sweets. It was a relaxing weekend and glad it is another short week. I hope you had a wonderful Christmas and that you have a great New Year. For those of you we haven’t spoken to in a while, we miss you and hope to hear from you soon. For those we got reacquainted with this year, glad to have back in our lives. For those that never left and are always there, thanks for being with us through 2009 and we look forward to the blessings ahead in 2010. Comic-Con 4 Day Passes are sold out! If you are planning to attend the Comic-Con International in San Diego on July 23-26, you will have to get individual day passes. The 4 day passes sold out since yesterday. We checked the site on Monday and they were at 80%, yesterday afternoon they were at 96% and today they are at 100% sold out. Fortunately we purchased our passes already so we are all set. We went last year for a day and had an interesting time. It is something worth checking out at least once in your life. Jesse enjoyed it so much, we got 4 day passes for this years. He even wants to dress up for it. Renee and I will go, but no dressing up. You get to see all the new movies coming out as well as TV shows and video games. We were going to stand in line for the Heroes session, but the line wrapped all the way around the convention center and all the way to Seaport Village. I refuse to camp out to see things. I will stand in line, but not for hours. We came home with all kinds of schwag – t-shirts, posters, stickers, etc. for shows and movies like Heroes, Lost, GI Joe, Star Trek, Star Wars and more. We had a quiet Christmas holiday as we tore open gifts, played games and ate our Christmas ham. I enjoyed yet another Zelda game for Christmas. This time it was Phantom Hourglass for the DS. I actually didn’t expect much for a hand-held, but the game is quite good. Renee got office supplies as she prepares to launch her Virtual Assistant business in the new year. Jesse received two PC games, but only one worked. He ended up playing Star Wars: Knights of the Old Republic as Unreal Tournament 3 had issues that need addressing. It kept crashing his computer after only a few minutes of play. I visited the Tech support forum and it was lit up with complaints and issues. I will see what I can do to resolve it tonight. I hope you had a great holiday. Edit 12/27/07: UT3 is working now after updating the video drivers on Jesse’s PC. He is now fragging the day away. This past weekend Jesse and I went to the Ontario Convention Center to check out LANFEST 2K7 hosted by NewEgg.com. It was pretty cool to see all of the vendors and the gaming paraphernalia there. I even won a brand new case for my PC from CoolerMaster. I told them of my replacing my power supply the weekend before with one of theirs and they let me spin the prize wheel. We also snagged some shwag from the booths by NVidia, AMD, Crucial, Seagate, Kingston, NewEgg, Shuttle, Antec, Microsoft and Logitech. It was pretty cool to see the gamers compete against each other too with huge Plasma screens mounted above their heads for all to see the action. Not bad for the $5 General Admission fee. We had a relaxing Labor Day Weekend. We ran to the mall for an oil change and car(truck)wash. We stopped by Barnes & Nobel to pick up my reserve copy of Inferno, the new Legacy of the Force Star Wars book. We went to the not-quite-a-dollar($3.50) theater and watched Ratatoullie. That afternoon we sat on the porch and enjoyed watching the lightning from nearby storms and even got a few sprinkles. Sunday morning, we enjoyed service live from Lakewood Church in Houston, TX for the first time in over 2 years. Jesse and I enjoyed a few rounds of LAN gaming(AOE III & UT2004). We cooked up a few Brats and had some potato salad yesterday. By last night, I had finished the new novel to cap off a pretty relaxing weekend. Seems like the summer months just pass faster than the winter ones. July 31st and another summer is waning. Not much going on other than work and video games. Work on my part and video games on Jesse’s. Though I must admit to playing a classic game at night. They opened a Gamestop here in AV and we were among the first to visit. Pretty amazing to see the place with all games in Alphabetical order and with titles that are hard to find. So I coughed up the money for the Ocarina of Time on Gamecube which contained the unreleased MasterQuest version. Nothing like wandering around Hyrule and killing skulltulas to pass the time. I now return you to your regularly scheduled program. Ok. This isn’t really an update or news, it’s more of me trying to find something to post about. Funny thing about starting a blog is that I feel obligated now to post at least once a week. Not much going on at the Zeliff pad. It’s been warm out lately and even went for a walk today at lunch. Kind of weird seeing the elementary school I attended from where I work. I have been all over the US and across the pond, yet I work within a half-mile of where I learned my ABC’s and 123’s. What does all of that have to do with the new Zelda game? Nothing. 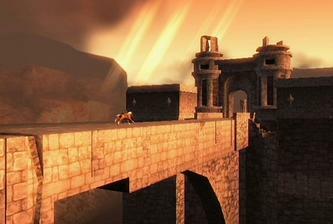 I have been playing it as time permits and I highly recommend it to any Gamecube owners. Probably the last good game to come out for that console.